Combine all dressing ingredients in a bowl and whisk until smooth. Set aside. Wash the kale and pat dry. Remove the tough stems, then roll up the leaves and chop. Add kale to a large bowl. Add about half the dressing and stir the kale to coat. Cut the ends off of the orange so it will sit flat. Cut the outer peel away so you’re left with only the flesh of the orange. Cut into 1/2 inch thick slices. 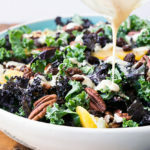 Add the orange slices, pecans, raisins, and chicken breast (if using) to the kale and toss. Drizzle with remaining dressing. Dig in!